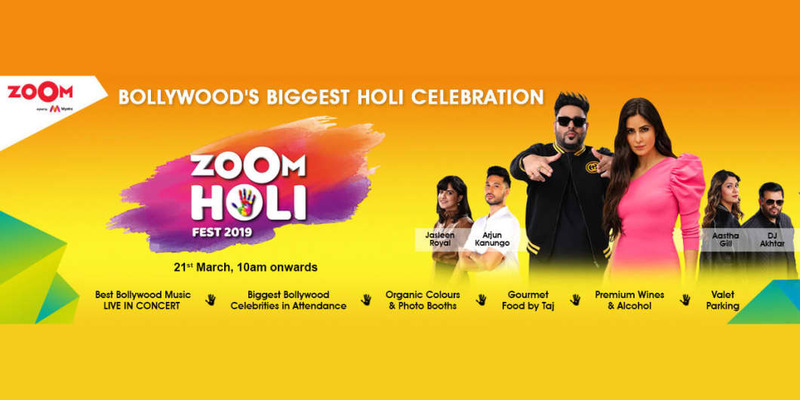 If you have always dreamt of celebrating Holi with the biggest Bollywood stars, the most sought- after performances and unlimited fun, Zoom will make this come true! Glam up your Holi and book your tickets to the most talked about Holi celebration in the city - The Zoom Holi Fest 2019 on March 21! With an opportunity to celebrate Holi along with the Bollywood diva, Katrina Kaif and the biggest B-Town celebs, Mumbai’s biggest Holi celebration is loaded with fun, entertainment, electrifying experiences and will be hosted in the heart of Bandra at the most happening and chic location. Get your dose of adrenaline rush with LIVE performances by leading Bollywood artists like Badshah, Arjun Kanungo, DJ Akhtar, Jasleen Royal, and Aastha Gill as they perform to Bollywood’s chartbusters. Making this year’s Holi your most memorable experience, Zoom Holi Fest promises a day-long celebration with a series of high decibel activities including dancing to your favorite Bollywood tunes, munching on sumptuous meals, clicking your best selfies and groupies at the Instagram zone, fun-filled Holi games like hula hoops, swings, sprinkler and much more!